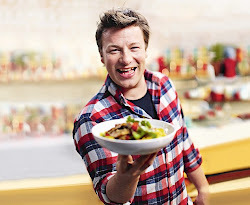 One of the best thing that I love about Jamie's salad recipes is that you can replace or add new ingredients to them and they still taste wonderful! 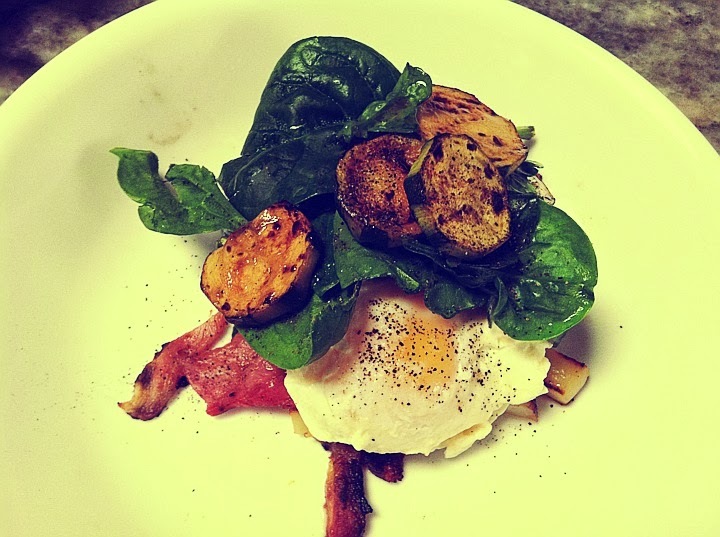 I replaced pancetta with bacon and watercress with spinach and I added zucchini into the recipe. But with the core or foundation of the salad being bacon, poached eggs and apples...whatever ingredients throw in or replaced will just further enhance the magical combination of this dish. Heat a wide frying pan and add a splash of oil. Fry the pancetta, ham and potatoes together for 10–12 minutes, tossing occasionally until the potatoes are cooked, golden and crisp. Divide between 2 plates. Meanwhile, bring a wide saucepan of water to the boil and add a splash of white wine vinegar. Poach 2 eggs gently in the water for a couple of minutes, until softly set. Remove and place one on each plate of ham and potatoes. Toss the watercress and sliced apple together and dress with a pinch of salt and pepper, a squeeze of lemon juice and a splash of olive oil. Top the poached eggs with a little pile of salad and serve.